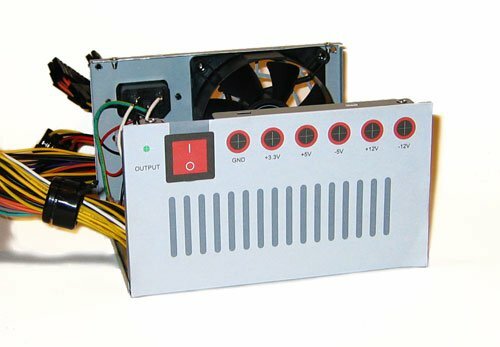 This post is the second in a series on how to convert an inexpensive computer ATX power supply unit (ATX PSU) into a useful tool for electronics projects or powering devices. The PSU case in previous article had vent holes on the back panel which put the binding posts in an odd arrangement. 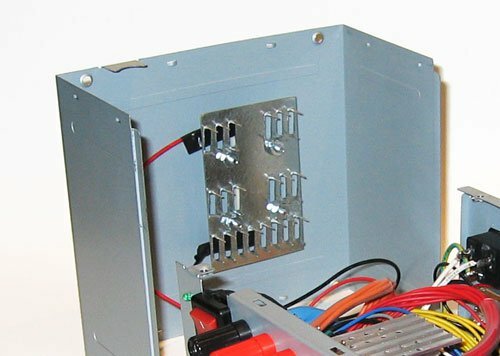 The vent holes on the back panel were a little different on this PSU case which allowed the binding posts to be arranged a little differently. The project can probably be completed in a day or so and requires only a few basic tools like a power drill and a few other hand tools. It would be helpful to have an assortment of heat shrink tubing and a heat gun, plus a hot glue gun, a soldering gun, electrical tape, some solder and a few other electrical tools like wire cutters and a wire stripper. WARNING!! 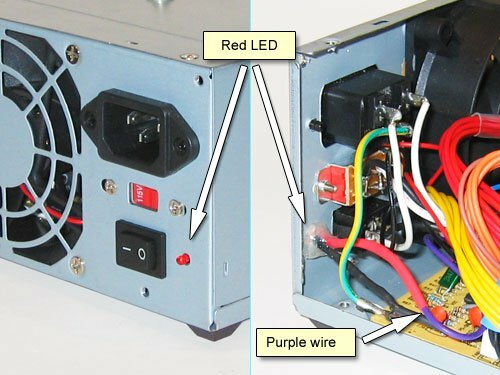 – DO NOT ATTEMPT to modify a computer power supply unless you know what you are doing! There is a possible danger of electric shock WHICH CAN BE FATAL EVEN IF THE POWER SUPPLY IS NOT PLUGGED IN. 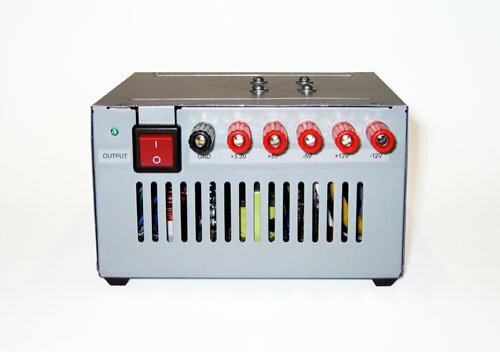 When you open a power supply or attempt to modify it for purposes for which it was not intended, you do so at your own risk! 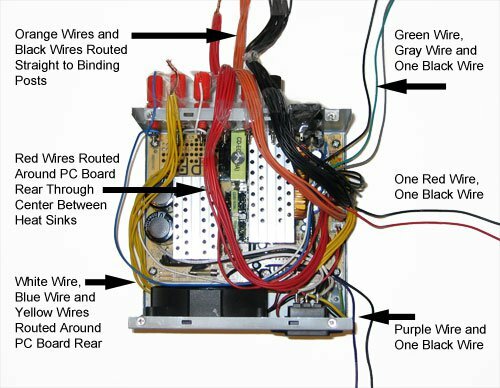 This project requires the following wiring diagram (the same one from the previous post). 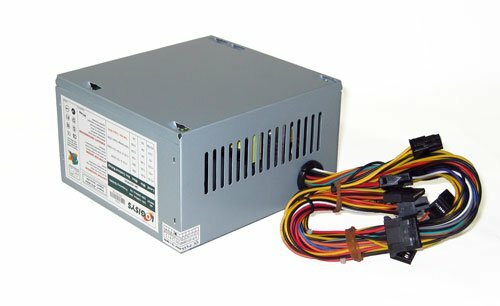 It would be helpful to read the first article in order to understand a little bit about an ATX PSU and the color coding of the wires. There are a lot of wires in an ATX PSU and the project will go a lot faster and easier if you are familiar with them, first. The exact number of wires and the presence or absence of a couple of them can be expected. 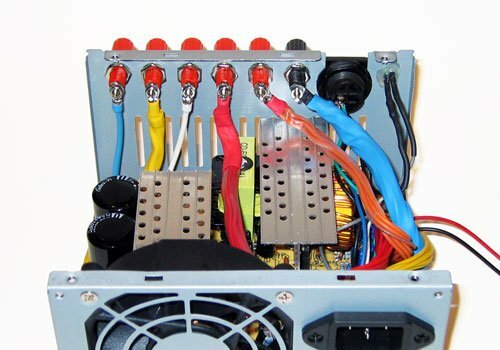 Not all PSUs will have a white wire (-5v) or a brown wire (+3.3v sense wire). On some power supplies the brown +3.3v sense wire is present and shares a pin socket with an orange +3.3v wire on the main connector. 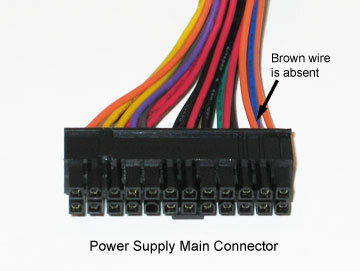 On other power supplies the brown +3.3v sense wire is absent and not found on the main connector. 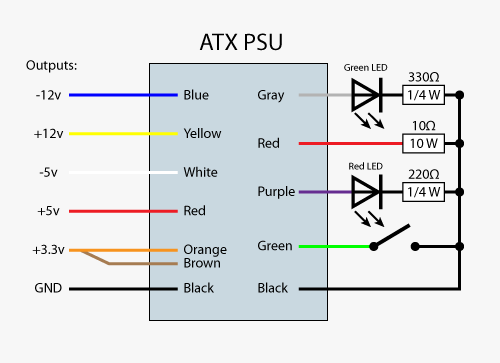 The white wire was eliminated from newer versions of the ATX specification. You won’t find it in some newer power supplies. In this case, you will not drill a hole for it or install a binding post for it. If the brown +3.3v sense wire is absent, then this is not a problem. If it is present, it is simply joined with the rest of the orange +3.3v wires. If it is absent you simply build the unit without it. It won’t make any difference. 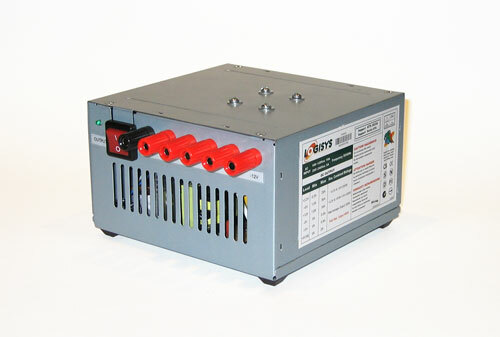 The unit used for this project was a Logisys PS480D 480 watt unit. As of this writing it is still available for purchase. This one was obtained online through Amazon.com. The unit is very reasonably priced and the case front has a good layout with air vents taking up only about half of the available space on the panel. There is plenty of room on the front of the case to install binding posts (banana posts), a rocker switch and a green LED. 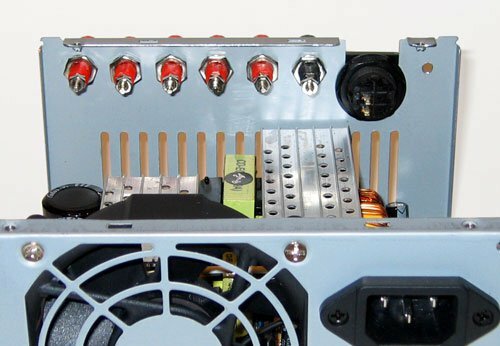 The unit has a main power switch on the rear of the case along with a socket for a power cord (the part that faces the back of a computer case). You will install a red LED next to the main power switch to indicate that mains power is turned on and that the unit is in standby mode. In standby mode the fan does not come on and the outputs are not yet powered up. When the rocker switch on the front of the unit is turned on, the fan will come on and the green LED will light up, indicating that there is power going to the outputs. Note: Before taking apart the case and voiding the warranty, you should test it first to make sure it is a good unit. 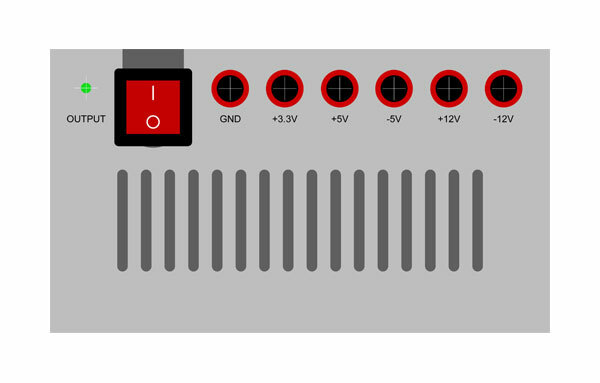 Refer to the section on how to “Test The Power Supply” in the previous post. One thing to mention is that the unit that was purchased for this build did not include a power cord. If this is the case, then you’ll have to buy a 6 ft power cord or use a spare if you have one. A drilling template for the layout of all the holes for the binding posts and LED on the front of the case is included with this project in downloadable Adobe Acrobat PDF format. You can use this layout (download PDF layout template 2). Important: Before drilling any holes, make sure your power supply comes with a white wire for the -5v output. If it is not present, then don’t drill a hole for it. You can shift the GND, the +3.3v and the +5v outputs to the right each by one hole and don’t drill the hole closest to the rocker switch. Print out the template on plain paper and cut it out. Remove the four screws on the top of the case and remove the top. Pull the wiring cables and plastic plug from the main slot on the front of the case and then attach the paper template with repositionable glue tape (obtainable from a stationery store). Using a hammer and a center punch (or even a long screw made of hardened steel), carefully make a small punch in the center for each hole. Carefully drill out each hole right through the paper template. Start with a 1/8″ drill bit. Drill each hole once with the 1/8″ drill bit, and then make the final holes for the binding posts with a larger bit. If you don’t have the exact size drill bit, you can drill the holes slightly undersized and then gradually enlarge them with a tapered reamer or a round file (a 1/4″ drill bit was used for this unit). Take care with the sheet metal. It is very soft. You can enlarge the hole for the LED with a utility knife. You don’t have to remove much material. After all the holes are drilled, install each binding post and the rocker switch. For this project a Radio Shack #275-694 rocker switch was used. It was very convenient because it mounts in a round hole. It fit right in without any modification. Below is view of the inside of the case with the binding posts installed. Use a black binding post for the ground and red binding posts for the voltage outputs. This is a good view that shows how roomy it is. 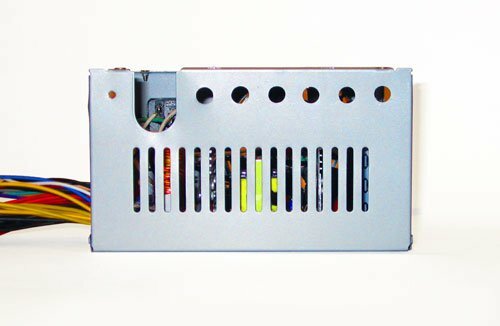 Most ATX PSUs have two large aluminum heat sinks (like this one below). The heat sinks in this unit are “T” shaped with holes in the tops to allow air flow. It looks like this design was optimized to take full advantage of the low air intake slots so the flow of air is channeled underneath for maximum cooling. After installing the binding posts and rocker switch, group all the wires together that have the same color. Sort out all the wires going to the binding posts. Arrange all the red, black, yellow and orange wires in separate groups and include the blue wire and white wire (if present). 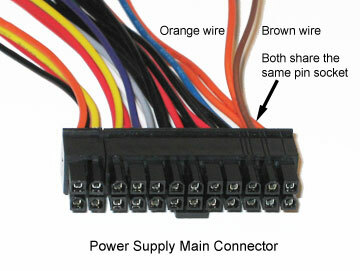 If a brown wire is present, include it with the group of orange wires. Then separate out the gray, green and purple wires for the rocker switch and LEDs. It would be helpful to lay out all the wires in a routing arrangement to be able to visualize how everything fits together. This is the time for planning the routing of every single wire. You don’t want to cut any wires too short. Lay them all out in an arrangement like the photo below. Use clear tape to stick everything down if you have to. Make absolutely sure that the arrangement allows room for the dummy load resistor and its heat sink (see below). Also make sure that there is enough clearance to fit the top of the case back on the unit so everything is enclosed. 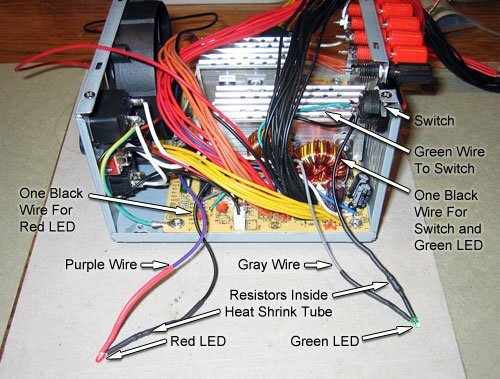 If you will notice in the picture above, the green wire, gray wire and one black wire goes to the upper right corner for the rocker switch and green LED; the purple wire and one black wire goes to the lower right corner for the red LED; and one black wire and one red wire are set aside for the dummy load resistor. Each LED will require a load limiting resistor. The wiring diagram above calls for a 330 ohm load limiting resistor for the green LED and a 220 ohm load limiting resistor for the red LED. Note: These are estimated values for most 3mm T-1 LEDs. To be sure, consult the specifications on the LED’s packaging or use an online LED calculator to help choose the correct resistors. Before soldering cut lengths of heat shrink tube and thread them onto the wires and push them as far back as possible away from the heat of the soldering iron. After the solder has cooled, push them back over the exposed soldered joints all the way up over the resistors and up against the LEDs and shrink them down with a heat gun. Tip: Attach an alligator clip onto the LED leads up close to the LED to function as a heat sink when soldering the LEDs. This will protect the LED from overheating by diverting heat away from it while soldering. Solder a black wire to one side of the switch and the green wire to the other side. Solder a short length of black wire to the black wire solder joint on the switch. Solder this short length of black wire from the switch to one end of the the 330 ohm resistor. Solder the other end of the 330 ohm resistor to the cathode side of the red LED (the flat side of the LED with the short lead). Solder the gray wire to the anode side of the green LED. Solder the purple wire to the anode side of the red LED and one black wire with the 220 ohm resistor to the cathode side of the red LED. Plug the power cord into the unit. Turn off the the switch for the voltage outputs on the front of the case with the green LED. Then turn on the the main switch first. Check first to make sure the red LED lights up. Next, turn on the switch next to the green LED and make sure that the fan comes on and the green LED lights up. If everything is working properly, the LEDs will all be lit up and all the outputs will be powered up. You can check them one by one with a multimeter. Power the unit down by first turning off the outputs. The green LED should turn off. Then turn off the main power switch. After a few seconds delay for the unit to discharge, the red LED should then turn off. If everything is working, glue the LEDs to the inside of the case with hot glue. Inside and outside views of green LED and rocker switch wiring. Please note hot glue used on inside to secure LED to case. Also please note wire colors. 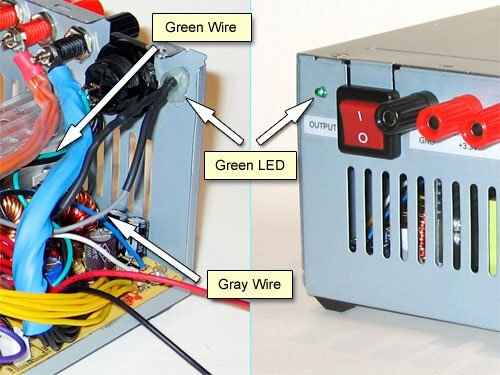 The pictures above and below show inside and outside details for the green LED on the front of the case and the red LED on the rear of the case next to the main power switch. Inside and outside views of red LED next to main power switch on rear of case. Please note hot glue used on inside to secure LED to case. Also please note wire colors. These are crimp terminals but you want to solder them instead of crimping them. Remove the vinyl sleeve with a utility knife and then solder the wires to the terminal. Twist the bundle of wires tightly together, then apply solder to the twisted ends. Cut the soldered ends to fit inside the terminal sleeve and then solder the wires to the terminal. After soldering, use heat shrink tube to insulate the sleeve and a partial length of the wires. If the number of wires will not fit inside the sleeve when twisted and soldered together, then spread the sleeve open with a utility knife and a small screwdriver. Gently squeeze it onto the wires before soldering. Each binding post on this unit has two jam nuts. Using a small socket driver, tighten the first nut all the way up against the binding post. Slip each ring terminal onto the binding post and screw on the jam nut. Tighten the jam nut onto the binding post with the socket driver. Top view of wiring to binding posts for power outputs. Please note how wires are routed around the rear of the case to allow room for the dummy load resistor and heat sink. Red and black wires extending out the right side of case connect to the dummy load resistor. Below is a view of the inside of the unit with the wires attached to the binding posts. All the wires are routed neatly inside the unit and are insulated with heat shrink tubing. The red wire and black wire on the right of the case are for the dummy load resistor. Another view of wiring to the binding posts for the power outputs. Please note the open space in the center to allow room for the dummy load resistor and heat sink. This unit required a 10 watt, 5 ohm ceramic power resistor. It is mounted to the top of the case with a heat sink. The heat sink is fastened to the case top with four machine screws (6 – 32 x 3/4 inch screws) with a nut, a washer and a lock washer each. The ceramic resistor is positioned between the heat sink and the case top and is held securely in place by the machine screws. 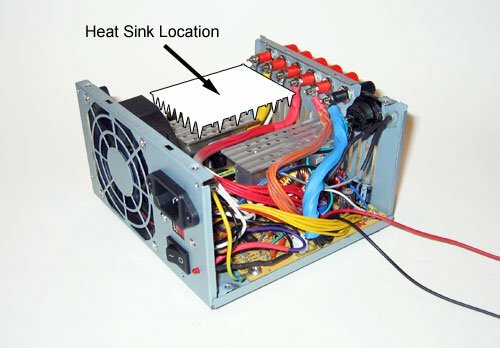 The heat sink is made from a 2 inch x 4 inch M24 mending plate – available at most hardware stores. It was trimmed down slightly to about 3 1/4″ in length. The resistor is positioned lengthwise, in the direction of air flow to reduce turbulence. After drilling the holes in the heat sink, position it on the inside of the case and put a mark with a felt tip pen through each hole onto the case top (inside). Place the case top on a flat surface that you can drill through. Use a piece of scrap lumber. Hold the heat sink tightly in place against the top of the case and use it as a drill guide to drill the holes in the case. M24 mending plate trimmed down and used as a heat sink for dummy load resistor. A single 10 watt, 5 ohm resistor was selected for this build and is secured to the case with 4 machine screws. There is one red wire and one black wire remaining. Solder one lead of the dummy load resistor to the red wire and the other lead to the black wire. Cover the exposed leads with electrical tape. Position the dummy load resistor between the holes on the inside of the case top. Attach the heat sink with the four machine screws, nuts and washers, but leave it loose. Gradually tighten each screw, checking to make sure that the resistor stays in position while tightening. Replace the case top with the four screws when done. Finally, attach four 1/2 inch brown vinyl bumpers (available at most hardware stores) to the bottom of the unit to finish the project. 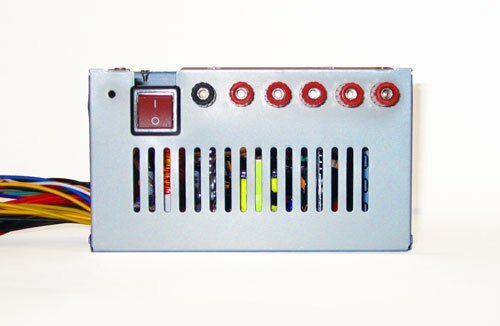 Shown in the photo above is the finished shop DC power supply. The last step was to print out another copy of the template from the PDF and make the labels from it. Many small manufacturers build a lot of their own tools. This one is a good project for manufacturers who need an economical shop DC supply. I was planning on putting a dummy resistor on each line to accommodate for these values. Is this necessary? 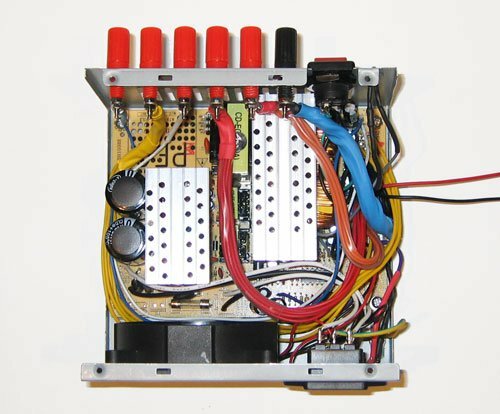 Since all tutorials I found were talking about putting a dummy load on 12V OR 5V line? I don’t believe it is necessary to put a dummy resistor on each line. The general guideline is to put the dummy load resistor on the rail with the most power. First of all, thank you for the fast response and the very useful guide! I ordered high power resistors to reach the minimum load on all power lines. But in theory it would be enough to just draw 1A from 12V1 and 12V2? 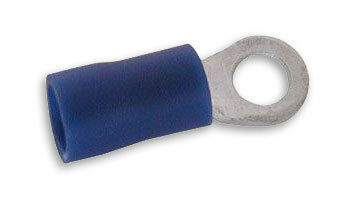 Some guides even say that, using a recent power supple, it is not even needed to use a dummy load? My power supply was able to turn on and deliver the correct voltages without any load. Would it be a bad thing if I did pull the minimum load from all the lines (leaving out of account the obviously wasted energy)?